Sometimes you wonder why you see the hair over the human, except for the palms of hands and at the soles of feet? Some women even think body hair is something disgusting. But do you know the purpose of hair is to protect our body? It means the hairs on the body keep a person warm, as nose hairs limit dust and dirt from entering the respiratory system. And eyebrows prevent sweat from entering the eyes. Human hair is indeed important. However, do you how the thickness of human hair? Finding out this golden information, you will be able to determine your hair density. Read more: 9 Terrific Natural Secrets To Lengthen Your Human Hair. 6 How to measure your natural hair thickness? 7 How thick is a human hair in inches? 8 Does hair color affect the thickness of human hair? 9 How do you tell when you encounter hair loss? 10 How to take care of your hair? Your hair density is basically how many strands cover your head. Let’s look at your hair roots with the scalp. How much of your scalp can you see in an area the size of a square inch? You can not count individual strands, but you can get a sense of how dense your hair is by how much skin you can see. Your hair density is basically how many strands cover your head. Thick density: In case you don’t see many scalps at all, you have a thick hair density. Medium density- If you see some scalp, you have medium density. Thin density- If you see a lot of scalps, you have thin hair density. Today, Layla Hair Company will share with you some exciting information about the thickness of human hair. What is our hair made of? Or What is the diameter of a human hair? Check our hair dictionary for exciting information on hair and learn some hairy definitions in the process. Please read until the end to find out what we have! Human hair consists of roughly 80 % of keratin (protein), about 10 to 15 % is water, and the remaining (5 to 10 %) are pigments, minerals, and lipids. Moreover, the cuticle layer forms the perfect outer layer for every hair. 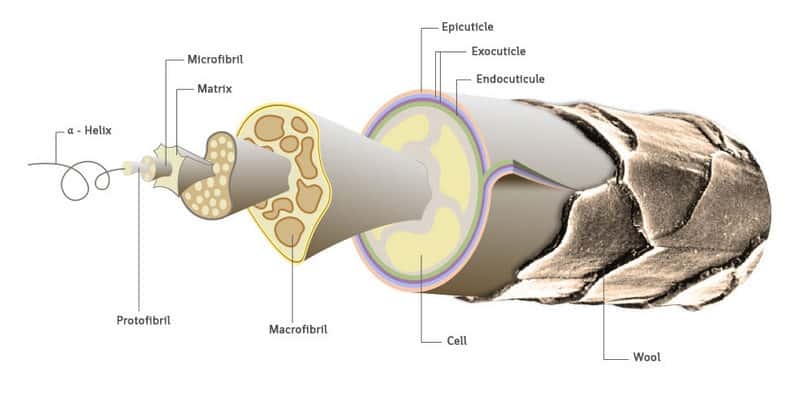 The cuticle layer envelops the inner part of the hair shaft called the hair cortex. Find out more about the cuticle layer in this article Remy Hair And Non-Remy Hair- Advantages And Limitations. The cortex comprises about 80 % of the hair mass. What is the thickness of human hair? Or How many hairs a person has on average depends on the hair color. With 150,000 hairs blondes have the most hairs. 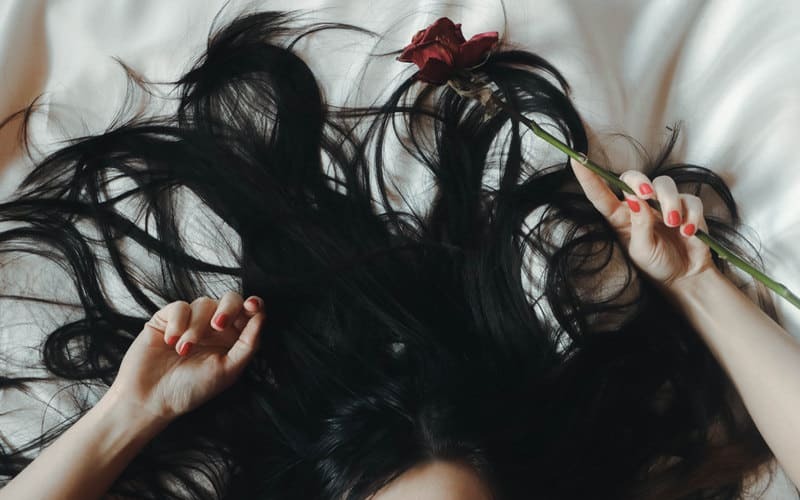 Black-haired people come in second with about 110,000 hairs, followed by brunettes with 100,000 hairs and redheads with 80,000 hairs. Moreover, Individual hairs go through a sequence of developmental phases. Most of the strands (about 8 or 10 hairs) are in the growth phase (anagen phase). In this phase, the new hair root is generated, and the hair grows. This step lasts between two and seven years. A two to three-week long transitional period follows (catagen phase). In this process, the cell production in the follicle stops temporarily, the follicle constricts, and the hair falls out. Approximately one percent of the follicles are in this transitional (catagen) phase. In the following resting phase (telogen phase), the hair follicle regenerates, the cells start to divide again, and a new hair starts to form. About 10 to 20 % of all hairs, in this phase, which lasts about more than three months. In order to find out the size of the thickness of a human hair as well as the average thickness of human hair, scientists use laser diffraction. Measuring the diameter of human hair by laser diffraction isn’t so difficult if you have basic background knowledge of physics. Of course, we don’t want to confuse our readers by trying to give you a step-by-step detail guideline to measure the thickness of a human hair. However, we will go through some basic ideas of how this process works. There is one thing we need to clarify first. 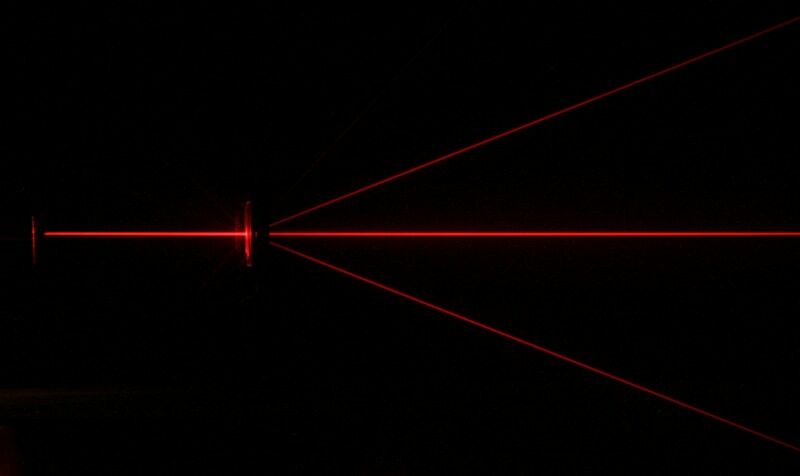 What is laser diffraction? It is a device that produces a concentrated beam of single-color light. You can find laser in almost many fields, especially in building and surgery. By using laser diffraction, scientists are able to tell you the width of this tiny string we have all over our head. When measuring the diameter of human hair by laser diffraction, the single-color light will hit the strand generating diffraction. Diffraction is the bending waves when the light hits an object. Looking at the bending pattern, scientists can easily measure the structure and diameter of a tiny object. So by using laser diffraction, scientists are able to tell you the width of this tiny string we have all over our head. Create a small frame to hold your hair. You can use a card box to make a frame as you want. The important thing is to cut a rectangular hold inside the cardboard. Make sure that the hair strand is long enough so that you can tape its ends inside the rectangle. Tightly tape the hair at the top and bottom of the frame. Bring it into a dark room, find a blank wall and stay away from it more than 3 feet. Shine the laser pointer and hold up the frame, make sure that the light hits your hair along its way to the wall. When the light hits your hair, it will scatter to the sides, and you can easily measure hair width with a bit of math. This guide isn’t intended for you to try because it is super easy. However, you can see how effortless it is for scientists to measure the diameter of human hair by laser diffraction. You can find an elaborated guideline on Science News For Students – a page dedicated to exciting science news. Hopefully, you have found some interesting information on measuring the diameter of human hair by laser diffraction. The diameter of a human hair does not have a standard value because each people have different thickness of human hair. The genetic makeup can cause the width of your hair to differ from that of other people. Notably, the color of the hair is also a big factor. Black hair is thicker than is red hair. Besides, the weather or climate can also affect the diameter of a hair strand. As the weather becomes warmer, the diameter of body hair rise. Age is another factor. Babies and young children have more beautiful hair than adults. When a person grows up, their hair becomes thicker and stronger. Another point is that the closer to the root of the hair, the thicker a strand of hair would be. Primarily, our genetic is the most factor decides the average thickness of human hair whether we have thick or thin hair. Europeans consider hair with a diameter of 0.04 to 0.06 mm as thin, hair with a diameter between 0.06 and 0.08 mm as average, and hair with a diameter between 0.08 and 0.1 mm as thick. By comparison with European hair, Asian hair is especially thicker. The average diameter of Asian hair is 0.08 to 0.12 mm. Besides, European hair has a somewhat elliptical shape, while Asian hair is rounded with more elastic. (1mm is equivalent to 0.039’’, the example about four-hundredths of an inch.) In Brian Ley research,1999, the thickness of human hair in meters to range from 17 to 181 µm (millionths of a meter). How to measure your natural hair thickness? Next, If you can determine your hair type or the hair thickness will help you figure out how to handle, cut and style your hair more effectively. Looking in a mirror and part your hair in the middle. Next, using your fingers or a comb to part your hair. Separate it into two sides. You are holding a chunk of hair on one side of the part. Move this chunk around a little bit, so you have an opportunity to see the roots of your hair from a few different angles. Your hair density is basically how many strands of hairs cover your head. When you are looking at your hair roots and your scalp, you can get a sense of how dense your hair is by how much skin you see. Thick density: If you don’t see many scalps at all, you have thick hair density. Medium density: If you see some scalp, you have medium density. Thin density: If you see a lot of scalps, you have thin hair density. On the other hand, you can compare the hair strand to the thread. Take a close look at your hair, like using a magnifying glass or mirror. If it is curly, stretch it out a bit before you compare it. Thin hair: If the hair strand’s thickness is thinner than the threaded piece, you have thin hair. Medium hair: If your hair strand is about the same thickness as the thread, you have medium hair texture. Thick hair: If the hair strand is thicker than the piece of thread, you have thick hair. Treating Hair Loss In Women: Is There A Way Out? 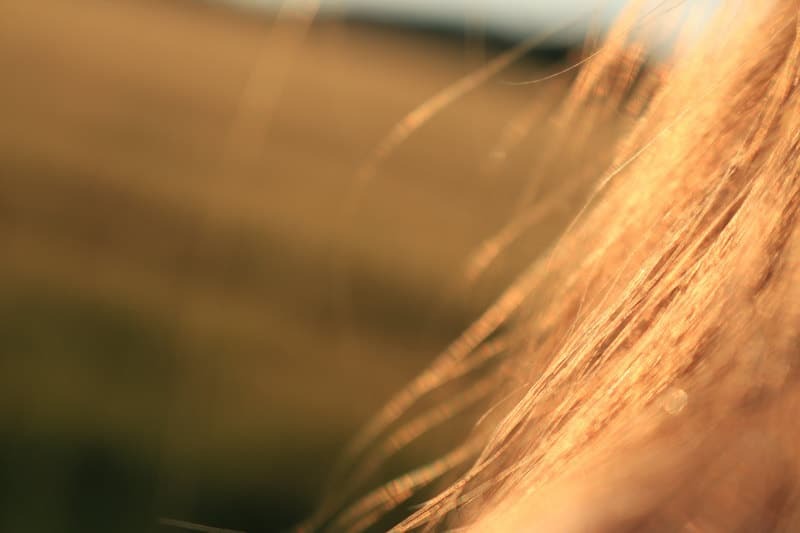 What Do You Need To Know About Best Organic Hair Loss Products? Hair Extensions For Hair Loss: The Ultimate Solution Found! According to the Physics Factbook, there is a specific measurement to identify the diameter of human hair. It is called micrometer; the symbol is µm. If you are not a real physician, looking at the µm is confusing. In scientific notations, µm is written as 1×10^−6 m, meaning it is one-millionth of a meter. For people who are interested in the thickness of human hair, the question “how thick is the human hair” would be a nightmare if we have to look at the measurement. According to the Physics Factbook, there is a specific measurement to identify the diameter of human hair. So, how thick is a human hair in inches? Human hair strands don’t have a similar thickness. This section can only answer the question “how thick is the average human hair in inches?” The range will be from 1/1500 to 1/500 of an inch. That is equivalent to 0.003 to 0.005 inch in diameter. The reason why hair has a different range in thickness depends on the elements of the hair. Hair from different parts of the body differs significantly in size and thickness. Apart from the components of hair, other external factors such as humidity, temperatures also affect hair diameter. How thick is a human hair micron? The range in thickness when considering microns as a measurement will be 76.2 to 127 micron. You can find out more about different measuring units on Google. However, it depends on you who decide which one is more readable and understandable. Does hair color affect the thickness of human hair? 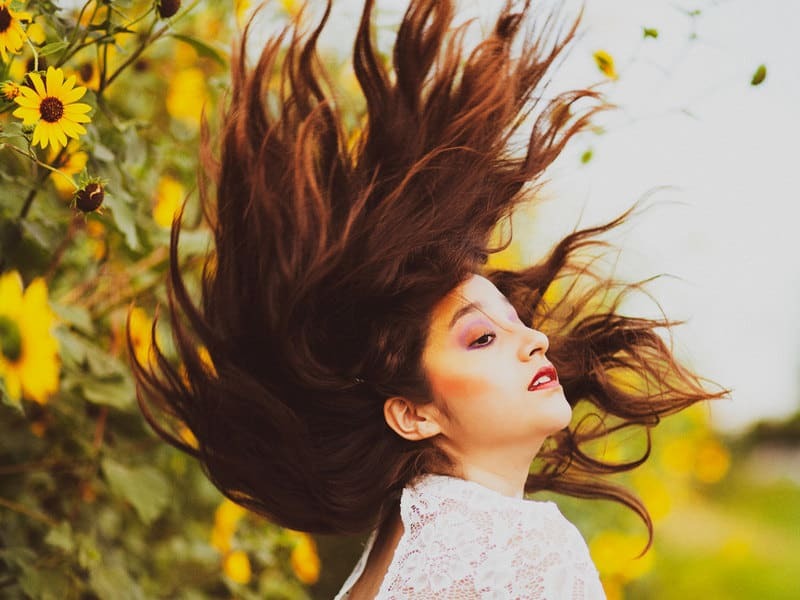 Now you have known how thick how thick is a human hair in inches a human hair in inches and another measurement, let’s find out the influence of hair color to hair thickness. Does hair color affect the thickness of human hair? If it does, how and why? Interestingly, hair with darker color tends to be thicker than a lighter color. Just look at a girl with black hair and one with blonde hair. Though the two have a similar amount of hair, black hair still looks denser. The rule of thumb is hair with dark color will look fuller even though it has a lower density compared to fine light hair. But why is it? Interestingly, hair with darker color tends to be thicker than a lighter color. The reason lies behind the amount of melanin in human hair. Melanin is a pigment in our skin and hair, which comes in different structures and ratios. There are two forms: eumelanin and pheomelanin. Eumelanin is unique since the color is brown and black hues. When melanin accumulates in human hair, our hair tends to get darker and at the same time thicker. Hair with less amount of melanin is lighter and more beautiful. However, the melanin attribution fails to explain individuals with dark hair and fine strands or blonde hair and thick strands. So what is the real cause? In the 20th century, when scientists for the first time discovered human DNA, everything seems to make sense. They found out that genetics play a critical role in defining hair type. That being said, your thin strands and black hair could only be attributed to your grand-grandparents. If you are trying to determine your hair type to find out whether it is beautiful, medium or thick there is a trick for you. You can compare your hair with a sewing thread. If your hair looks thinner than the thread, chances are your hair is fine and thin. If your hair looks significantly thicker than the thread, you have thick hair. The density of hair could be determined by looking at your scalp. By parting the hair in different areas, you will notice the mass of your hair. When you less scalp, your hair is thick. How do you tell when you encounter hair loss? The type of hair related different qualities of your hair, like density, texture, porosity (your hair’s ability to hold moisture), elasticity. A hair stylist can use your hair type results to recommend the best hairstyles, colors…for your hair. On average, a hair remains in the scalp for six to eight years before it falls out. The individual lifespan depends on genetic factors. In cases of severe hair loss, the lifespan of hair may be reduced to three or four years. The type of hair related different qualities of your hair, like density, texture, porosity (your hair’s ability to hold moisture), elasticity. However, losing 30 to 100 hairs per day is normal. A lot of conditions can become reasons for losing more than the maximum of 100 hairs per day. In about 95 % of all cases of both men and women hair loss, genetic factors are to blame. You need to know due to the overproduction of male hormones (androgens), the blood supply to the hair follicles is reduced, and in turn, the hair is no longer tightly anchored in the scalp. How to take care of your hair? It’s such heartbreak to find your once healthy hair become brittle, coarse or have split ends. Styling hair with high frequency requires using tools such as hair dryers, hot rollers, curling irons, and flat irons. All related heating the hair follicle, which results in not enough of moisture, making the hair brittle and rough. And Women frequently use flat irons for temporary straightening. After a point, the hair is not able to take any more heat and just burns. Furthermore, using the dryer sparingly and on the minimum setting. The best thing to do is to allow the hair to air dry. Best hairstylists would suggest that heat treatment should be alternated with intensive hair care to reverse the damage. Besides, all services like bleaching, hair dyeing, perming, straightening and so on often use strong chemicals. The chemical treatments make the hair cuticle to swell up, making it weak and prone to damage. The methods above make the thickness of human hair decrease more and more. Please keep your hair always healthy! Layla believes that if you follow this article, you will deep understand about the thickness of human hair. Moreover, you also know some way to determine the average thickness of a human hair or what is the thickness of a human hair? And how to measure hair thickness?